Positioning shouldn't be left to chance. Unless you do your research, your message to the market has almost no chance of getting through and hitting the mark. This article explains why you must understand the 3 Cs of successful positioning—your customer, channel, and competition—as well as you understand your B2B product, service, solution, or company. And it offers suggestions for how to go about it. One reason companies fail to thoroughly research the 3 Cs is that they don't have time to do it: It can take weeks. If the only research you have time to do is about the channel, at least the intelligence is coming directly from the battlefront. Your channel is one of the best sources of information about the other two Cs—your customer and competition. The channel is your first venue of interaction with what you hope will become your customer. And it's the battleground for the ongoing war with your competitors. The channel helps you identify challenges in the sales cycle that may impact your message strategy. Channel intelligence also helps you zero in on competitive strengths and weaknesses. That knowledge helps ensure that you focus your message strategy on what you do well—and steer clear of what you don't. Learn what's really happening in the channel, and you gain insights into the details of purchase processes, demographics, psychographics, sales strategies, and customer concerns. The channel can also provide valuable feedback on the viability of your marketing message. Ongoing communication with your channel will improve the relationship and, as a result, the flow of honest information and battlefield intelligence vital for your positioning strategies. Many B2B marketers and product marketers are too inwardly focused on their product or their company. Chest-beating and proclaiming "we're No. 1" doesn't get the job done in B2B marketing. One way to test a positioning statement is to ask "so what?" Usually, you'll find a higher-level benefit when you test "we're No. 1" claims by asking "so what?" A better approach is to focus like a laser beam on customers and what's keeping those target customers awake at night. Therefore, your ability to identify and rank customer problems is a critical success factor in creating a compelling positioning statement. Your positioning statement should state a benefit that addresses your target audience's No. 1 problem. When you do so, your target audience will listen to your message. That's because today prospects are overwhelmed by marketing messages. They get so many—literally thousands per day—that they have become experts at filtering them out. You can get through the filter, but only with a benefit statement that addresses your target audience's primary concern. Buyers will listen to your message when you demonstrate an understanding of their problem and clearly communicate the benefit your product offers to solve that problem. Is it unique? That is, only you are making the claim. If you answer "yes" to both questions, you're on your way to successfully positioning your B2B product, service, company, or solution. Unfortunately, many companies ignore how their competitors are positioned and make identical claims. I call it "me too" positioning. In every B2B software market I follow, there are at least two companies making the same claim. 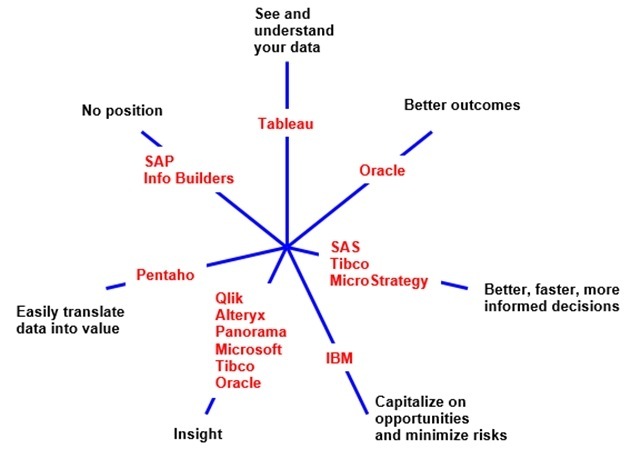 In the business intelligence (BI) market (see perceptual map below), no less than seven vendors are claiming "insight"; three are claiming "better decisions." Ironically, it's pretty easy to figure out how your competitors are positioned because they do it in public. Pay close attention to what your competitors are saying on their websites and in their marketing communications, such as webinar promotions, press releases, emails, blogs, etc. A positioning statement frequently appears in a prominent place on the homepage of a website, in a press release, or a brochure. Failure to differentiate creates market confusion that inevitably leads to longer sales cycles, a problem that's all too familiar in B2B technology and software. By using perceptual mapping, you'll be one step ahead of the competition, because you'll know that you are making a unique claim that sets you apart from the competition. Just as positioning is the foundation for everything you do in marketing, your 3 Cs research is the foundation for your positioning statement and message strategy. For more on how to do the research necessary to position effectively, check out The Three Cs of Successful Positioning and Positioning: How to Talk so the Market Will Listen.